When you’re taking the kids out into the wilderness or just out for a day hike in your favorite canyon, you want to make sure they can always contact you. Likewise, if you and your crew are crushing a trail on your bikes or scaling up a rock face, an open communication channel is important. The Motorola Talkabout T100TP nine pack is a simple, compact radio with just enough features to stay in contact anywhere you go. If you’re looking for a basic two-way radio, congratulations, you’ve found it. If you don’t need a lot of features, and you just want to be able to warn your fellow hikers of a snake on the trail up ahead, the T100 is so simple that a child can turn it on and use it. Pick up regular AAA alkaline batteries at the store and your T100 can run up to 18 hours. A flashing alert reminds you when your battery power is starting to get low. Use the power save feature so you can help cut down on battery strain while you are out and about. To prevent exhausting precious battery life when you’re in remote locations, the timeout timer ensures that you conclude your transmission definitively. Press the Talk button for 60 seconds and wait for the tone, so you know that you’re no longer transmitting. In open conditions, the T100 has a 16-mile range. Of course, this will vary depending upon the terrain and other conditions that could block the signal. Enjoy a 3-mile range in open water, and a .5 mile range in your neighborhood, so now they really don’t have an excuse when you tell them it’s time to come home. Use any of the 22 channels so you have secure and clear communications with everyone on the other end. Each radio only weighs .25 pounds or 4 ounces, so it doesn’t hold you back on your trail run, hike or relaxing picnic. Attach it to the belt clip so it’s safely stowed out of the way when you’re gripping those handlebars or hanging off a rock. The electric blue accents make it easy to see anywhere if you inadvertently drop it. Call tones let your family or friends on the other end know that they’re making a call. It’s a little more attention-grabbing when you’re out in the middle of the woods or if they’re calling to tell you it’s time for grub. Provided that all the radios your group uses have the FRS/GMRS standard, your T100 will work with other brands and models. Make sure you’re on the same open channel, and you’re all set. You always have to contact the FCC if you’re using GMRS frequencies. Call them at 800-418-3676 to confirm what forms you need to file. If you don’t want any tiny fingers inadvertently deleting all your personal settings, the keypad lock allows you to set a security code so only you can have access to your controls. 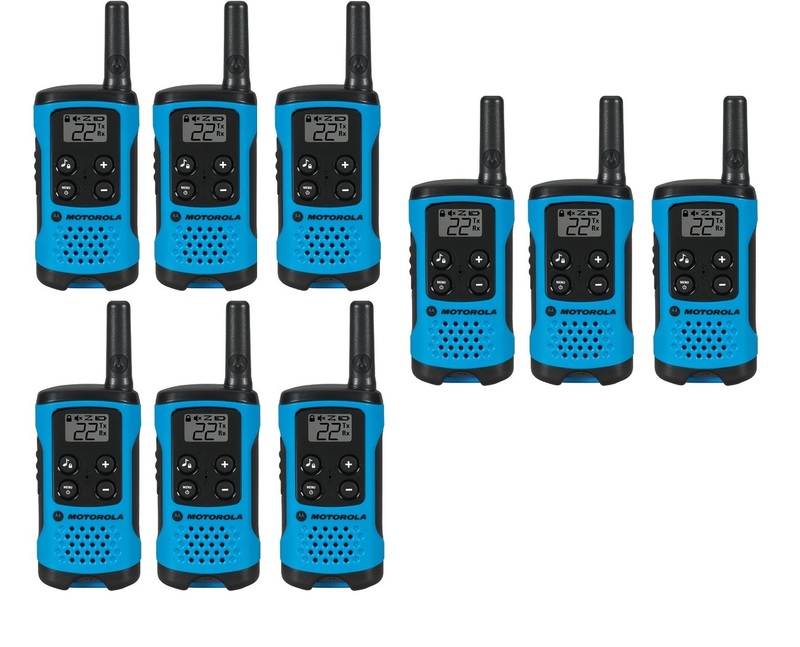 Motorola Talkabout T100TP Triple pack radios are good for great family fun to keep in touch while hiking,camping at an event,ball game or out playing in the yard. Great for use with children where this is no cell coverage while camping in state parks,camping and hiking. Pretty good range for general purpose use around the home or keeping in touch during hiking through the woods or fishing. Use the monitor setting to determine if a channel is currently in use. Simply press and hold the button for three seconds to find an open channel. The auto squelch feature helps suppress the audio if you don’t have a strong input signal to reduce interference and static. The triple pack radio measures 5.22″ x 1.91″ 1.10″ inches, and with batteries weighs .25 lbs and you will get two sets and total of six radios. If you have any questions about the Motorola Talkabout T100TP Walkie Talkie nine Pack Set, please don’t hesitate to contact us. All questions/comments are routed to our customer support team , so you WILL receive a prompt response! Please contact us for a return within 45 days of purchase for a refund. All items must include original packaging to receive a credit. We try our best to ship out all purchases that are made Monday through Friday the SAME DAY, if the item(s) is ordered by 3pm EST. Items not sent out the same day will be sent the next business day. Items purchased before 3 PM Eastern time on non-holiday weekdays will ship the same day. Tracking will be added to the item after 4 PM central time. We allow returns for 45 days. Please contact us for a return. All items must include original packaging and be returned in original packaging to receive a credit.